Italian company Saipem designed the hexagonal platform for the Aflowt project (Accelerating uptake of floating offshore wind technology), which is to be subjected to one year’s testing off the west coast of Ireland. Once planning, permitting and supply chain requirements are in place, it could be deployed from 2022. The European Union’s Interreg North West Europe fund will provide €14.1 million for the project, which the developers hope will demonstrate the "survivability and cost-competitiveness" of floating offshore wind and help develop an Irish supply chain. The project will cost €31.1 million in total. The partner organisations will contribute the remaining funds or source this privately. It is further hoped that by testing the floating platform in the harsh waters off the Irish west coast, it can be prepared for any deep-water site. Aflowt is being developed by a consortium, led by the European Marine Energy Centre (EMEC), of companies from Ireland, UK, France, Italy, the Netherlands and Germany. The floating concept is a pendulum lightweight structure consisting of a hexagonal platform, which will be ballasted by a counterweight connected by tendons, anchored through simple lazy wave mooring lines with a drag anchor. It will support a second-hand turbine to be sourced by the Aflowt consortium and adapted for an offshore setting. 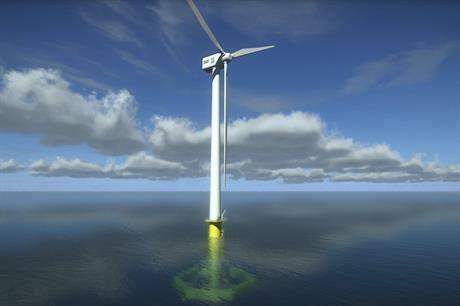 The platform is designed to eventually accommodate "very large turbines planned for the future", EMEC stated. The EMEC-led consortium is completed by oil and gas contractor Saipem, French company Cable Life Cycle Assurance, the Maritime Research Institute of the Netherlands, Fraunhofer Institute for Wind Energy Systems (IWES), University College Cork and Irish utility Electricity Supply Board’s Engineering & Major Projects division (ESB E&MP). In a report outlining the potential for offshore wind deployment in Ireland, trend market analysts KPMG suggested the country could become an industry leader in floating wind due to the nature of the sea basin and the large scale of the natural resource off its west coast. However, the head of the ORE Research Group at the Marei Centre, University College Cork — one of the members of the Aflowt consortium — has warned against developing such projects in the Atlantic. Despite its excellent wind resource, the west coast of Ireland’s harsh environment would create difficulties in installation and operations and maintenance activities for developers, Jimmy Murphy argued.